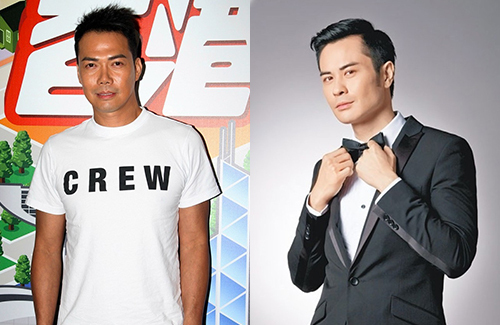 This week, gossip mills are churning with the rumor that Kevin Cheng (鄭嘉穎) will be leaving TVB at the end of the year. His good friend, Michael Tse (謝天華), has confirmed that the rumor is indeed true. “This is still a rumor? Isn’t this a known fact already?” said Michael. On Friday, Michael showed up at TVB Studios to film Eric Tsang’s (曾志偉) new game show I Love Hong Kong <我愛香港>. Michael, who left TVB in 2013, has been spending the last few years doing variety shows in Mainland China. Michael starred in the Mainland survival reality series Survival Games <跟著貝爾去冒險>, in which he explored rural lands and learned how to survive with limited supplies. Kevin already can considered left tvb long time ago. He only occasionally do a series with tvb, but he gets to choose. Just hope that he bring his gf out of tvb too. @dramadrama please don’t interview KC’s girlfriend or we will suffer several pages of her yakking. @janet72 lol, don’t have to wait too long. She will appear soon to yak about his birthday celebration with her. @celin of course…she will never give up an opportunity to yak…which is why reporters love her. Good for his career, bad for HK industry of course. Another good actor gone, now we have to put up with another series star Johnson Lee as lead?? Sad sad time for TVB. Don’t recognize any of them actors actresses anymore. @sammie1988 ‘house of spirits’ was good. now we have present one with nancy, Philip, ruco and several veterans. Johnson lee is better than Jason chan.